They were down by twenty points, with but one quarter left to play. The crowd had started to disperse the last time Temple scored. There were Owls fans talking trash upon the GoMids message board. If nothing else at least we would see Ricky take some snaps. Inspiring fans to lift him up with hyperbolic praise. “He can run, and he can throw! He’s talented! He’s unique! It wasn’t time for Ricky Dobbs to play full time just yet. That was the sign, the coaches knew, and Ricky got the call. But things weren’t any different, and still the offense reeled. First he was stuffed behind the line, and then he threw a pick. One more time, Coach Niumatalolo said DAG NABBIT. Instead he calmly told his signal caller to keep fighting. The next drive went much better as young Ricky found his groove. A swing pass to Kettani, and the team was on the move. But it was obvious that the touchdown drive had planted a seed. So Ricky led the offense onto the gridiron once more. A bullet pass to Tyree Barnes, and the stadium went berzerk. Another strike to Bobby Doyle! Navy’s knocking on the door! A couple runs by Ricky, and it’s third and goal from the four. He ran hard, but on third down, Kettani couldn’t punch it in. They had to score on the next play to have any chance to win. Both teams lined up, but Ricky didn’t see there was a glitch. The Temple linemen hit him like he just stole their cheesesteak. Flipped the ball to Eric for a touchdown, Navy’s third. If the defense couldn’t stop the Owls, then Navy would be beat. The defense knew they had to play like they were on a mission. The Owls could take a knee and run the time off that remained. Setting up a play that would be nothing short of stunning. Clint Sovie made a heads-up play, and recovered the strip. Sprinting up the field, the swift linebacker didn’t plod. 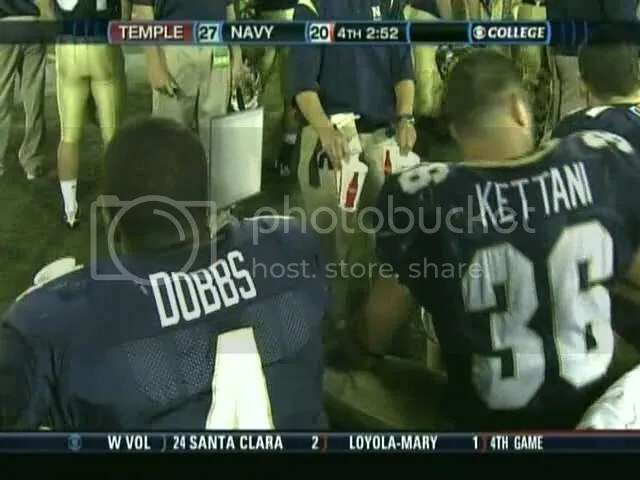 And now the Navy coach knew he had Temple on the ropes. With overtime about to start, would the team finish the task? That Temple still had twenty-seven; Navy, thirty-three. Ok, dude. Do you also have the Holy Grail? This should replace “Laws of the Navy” in Reef Points. Wife out of town again? Haha I love it. I was there. a great game! Thanks for that TBD, really enjoyed it. BTW, seeing Byrd getting tossed in the air never gets old..
Ernest Thayer has NOTHING on you, Mike! You are truly the Poet Laureate of Navy Football. I left that game at the beginning of the fourth qtr and drove to the Outback in Springfield Va for dinner. When I saw the final score I almost fell of the bar stool. I also was at the game, but sitting in the end zone with a group of boy scouts. At my advanced age (class of 1960) I can hardly read the jersey numbers from the stands in regular seats, so all I really saw was the flyover. I therefore was very happy to see replay of the game on CSTV and clips like those in this web piece. We necessarily are very excited about this up- coming season with Dobbs at the helm. GO NAVY!! I still contend I had as much to do with the victory as anyone else … over the previous 2 years, my parents have come to town for one Navy football game in the fall. Navy would lose every game they attended. When Navy went down 3 scores, I knew what I had to do — I had to get mom and dad as far away from NMCMS as quickly as possible. As we put more and more distance between ourselves and the game, we listened to the Navy revival by radio. The lesson I’ve unfortunately learned is … no more live Navy football for the family — sorry, guys. Mike – While checking my fall calendar, I was reminded that Navy plays 13 regular season games this year. (I understand that when a team plays Hawaii they get an extra game to help pay for the trip.) How does that affect our bowl eligibility? Do we now have to win 7 games instead of 6 so that our record will be above 500?